They say it tak's a lang spoon tae sup wi' a Fifer. We may be sweet (and sometimes bitter), but we're definately a warm hearted bunch of people. That's why 100% of sales from our exclusive new coffee blend served across our venues will be re-invested back into Fife Cultural Trust (ON Fife) , helping us to grow our services throughout the region. Fife has a rich history of food and drink production, both at land and sea; we have long understood the needs and challenges of farmers and suppliers. Our new partnership with Fife-based Myrtle Coffee has enabled us to collaborate with an ethical supplier of the finest blend. A rich combination of Brazilian beans (from Minas Geriais), Colombian Arabica (from Medellin) and a hint of Indian Robusta (from Kerla), this sweet chocolatey blend will set your tastebuds racing. AND FROM CUP TO CULTURE. In addition to supplying our cafes, bars and restaurants with the blend, we will also retail two sizes of bags for our customers to make at home. 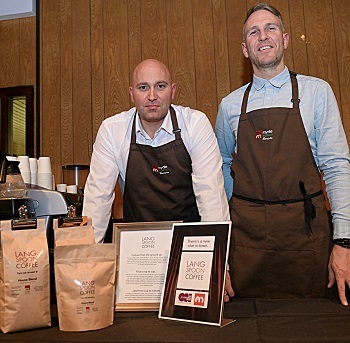 As sales grow, we'll be able to show how their investment in Lang Spoon Coffee is making a difference in Fife's cultural sector through social media. Follow Myrtle on Facebook, Twitter and Pinterest or visit Myrtle's website to keep up on developments.